Play like a Rock God and eat some chicken while you’re at it! In the last several weeks several QSR’s have launched promotional tie-ins with video games/consoles. In the world of “new” media, advertisers are looking at every conceivable avenue to try and promote their Brand. KFC launched the “KFC Rocks” Guitar Hero World Tour contest in conjunction with the video game‘s recent launch and KFC’s branded in-game integration and on-cup video game promotion. 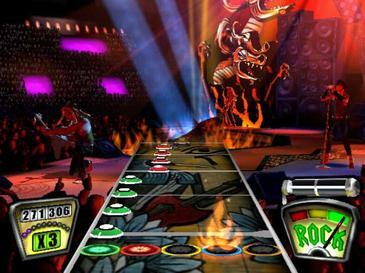 The contest allows gamers to attempt to beat Guitar Hero expert Dave Barley’s high score for the chance to win a year’s supply of KFC and $2,500. I can attest to the KFC product placement in the GH game. I was shredding to a Jane’s Addiction song when I notice the KFC bucket very prominently displayed on the screen. Burger King Gift Card and Wii Promotional Tie-in. Just in time for the holidays, Burger King has kicked of a promotional tie-in with the Wii. The sweepstakes offers customers a chance to win one of 500 Wii systems with a purchase of a BK Crown card. The Wii is still a popular item around the holidays. There are already rumblings that they again will be hard to come by this year. It will be interesting to see if Burger King’s gift card sales spike sharply during this promotion. So why are Brands doing this? Video games have become an entry level for brands trying to reach a younger demo. Brands are using online games and in-game advertising to place there logos throughout the gaming experience. How does the recent economic landscape play into this? Despite success in the video game industry it is likely that the current state of the economy will slow the rollout of these types of ventures. Brands will not look to use “experimental” advertising until the economy comes back online (no pun intented). EMarketer estimated that U.S. marketers spent $2.6 billion on “experimental” advertising in 07 (social networking sites, mobile devices, video games, online videos and web widgets). With the tough times this number will more than likely be reduced for 08. 09 will not look much better. All that said, the next time I play GH I just might have a bucket of chicken next to me.